Particle & Surface Sciences are the sole distributors in Australia and New Zealand for the Dataphysics range of products. An advance in time-resolved measurement of interface-chemical properties is reported by DataPhysics Instruments GmbH of Filderstadt, Germany. It is now possible to measure rapid sorption processes on the surface of paper, fabrics, membranes or filter materials. DataPhysics’ OCAH 200 optical high-speed contact angle measuring system, available from Particle & Surface Sciences, is able to process up to 360 video frames per second. 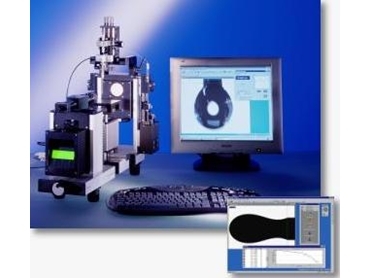 In this way characteristic parameters of absorption, such as wetting angle, drop volume and wetting surface can be measured simultaneously with a time resolution of 2.8ms. The user software SCAH 200 as a 32 bit application under Windows NT/2000 ensures a high user-friendliness and permits comfortable and efficient work. The instrument system is completed by special sample holders for films and membranes as well as by temperature controllers for temperature ranges between -10 and +400°C. A newly developed spot analyser permits to watch the spreading behaviour from above. For exact time-controlled dosing, motor-driven single and multiple dosing modules are available. Typical applications for the OCAH 200 are for instance the optimization of wetting and of permeation properties. Particle & Surface Sciences also offer a wide-ranging programme of support solutions, including installation and service of all instruments by factory trained technicians, an Analytical Laboratory and a Sales Department to assist with the customers’ enquiries. Particle & Surface Sciences will be running a series of Dataphysics seminars across Australia during 2009.